I really loved the bold floral pattern on the inspiration photo, and decided to go bold as well for my card. Sometimes when I work on a color challenge, I have to remind myself that I don't have to use all the colors in the same amount. In fact, it is better to follow the 'gallon, quart, pint' rule that I heard about somewhere (probably a PTI Make it Monday video). 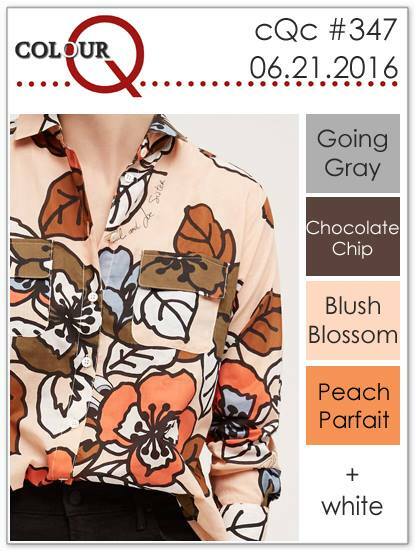 I used the dark brown (Memento Rich Cocoa) for my Mondo Magnolia stamp and sentiment, Peach Parfait (for me, Crisp Canteloupe paper) and Blush Blossom (Sweeet Blush paper) for my flower--which I fussy cut, and Going Grey (liquid pearls) as an accent color. The this bold fussy cut flower over the embossed panel,Joyce! Stunning! We are cooking over here and now tons of ash! Your brother is near the fires right? Hope he is ok.
Oh my, Joyce... this is absolutely gorgeous. What a great palate to work with, and you have done a beautiful job of working it with the inspiration piece. It's a stunner! Joyce Mondo Magnolia looks fabulous in these colours and especially over that subtle embossed background! Gorgeous! Amazing! I love how you made this busy challenge photo so clean and simple!! Beautiful! Joyce...your Magnolia is so beautiful and it looks simply stunning in this week's ColourQ colors. Just love it. Beautifully done Joyce, this is marvelous!! What a beautiful and striking flower in the ColourQ colours, Joyce!!! Really lovely!!! I never grow tired of this bloom, and I love how you used the gallon, quart, pint rule for your colors! Loving the textured background, too! Another gorgeous card, Joyce! Beautiful, amazing use of those colors - so mondo lovely and full of prettiness! !